It is easy to identify the size of your 105-engine. There are two ways to do it: Check the identification mark on the front of the head, facing the radiator. Measure the distance between the head and the top of the waterpump. I have spent lots of time doing this chart, so please ask me first before you copy and use it. Engine number is stamped on the left side of crankcase, close to the fly-wheel cover. The entire engine and type table is here. This is how I do it. Buy yourself a workshop manual to learn more about the Alfa engine. Be patient and wait until the engine is cool. 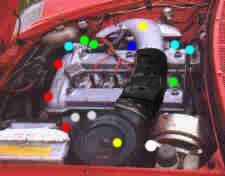 remove it to get better access and visibility of the engine. The photos will guide you through the steps. Loosen the coolant hoses from the head. 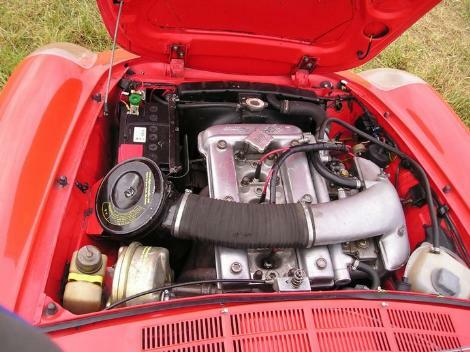 Don't forget to take away the servo hose from the back of the manifold. Light blue dots. Loosen the cast iron exhaust. Grey dots. Loosen the exhaust support from the gearbox to get easier access when loosing the cast iron exhaust. Loosen the spark plugs but don't remove them yet. This is to prevent dirt and grease to fall into the cylinders. Remove the camshaft cover. There are two bolts in the front also. Undo the two bolts under the front of the head. 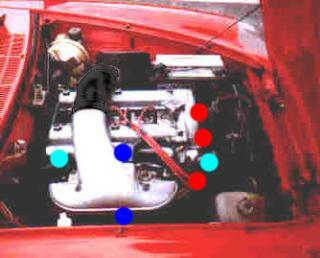 There is one close to the alternator and the other one is close to the fuel pump. Red dots. Turn the crankshaft until the timing marks on the camshafts are exactly in line with the marks on the cam shaft bearing caps. The cam chain lock must be visible since it will have to be removed later. Check that the timing mark in the front is on the TDC point. Look down under the alternator to find the crankshaft pulley. Loosen the bolt holding the chain tensioner pulley. Gently press the chain down by hand to slacken it. Tighten the bolt holding the chain tensioner pulley. You don't want to have the chain falling down. 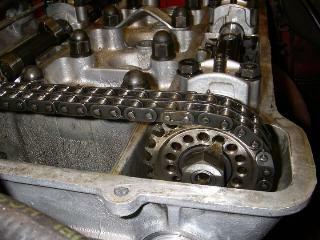 Place a piece of paper under the cam shaft chain to prevent the lock to fall down in the engine, then remove the cam chain lock. Tie a wire to each end of the chain, otherwise it will fall down. Remove the camshafts if you like. Loosen the ten bolts holding the head and lift the head. Watch the O-rings so they don't fall down in the engine. Do not move the crankshaft with the head off. The liners may move and it might be tricky to get the engine tight again.